Summary: Lena Duchannes is unlike anyone the small Southern town of Gatlin has ever seen, and she's struggling to conceal her power, and a curse that has haunted her family for generations. But even within the overgrown gardens, murky swamps and crumbling graveyards of the forgotten South, a secret cannot stay hidden forever. 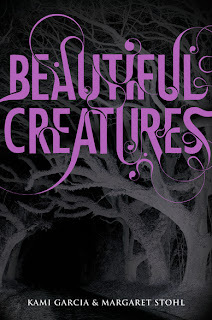 I was over the moon when I found out that there would be a third book to the 'Beautiful Creatures' series by Kami Garcia & Margaret Stohl. The novels centre around the love story of Lena Duchannes and Ethan Wate. The third in the series will be 'Beautiful Chaos', which will be available this October. 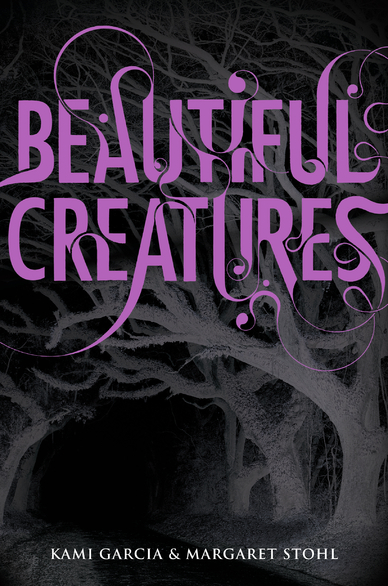 So, I thought I'd put pen to paper and write a review on the first chapter of the series, 'Beautiful Creatures'.When my friend Kellie told me to read the back of this book, I was in awe. I knew her recommendation would be gripping as she had previously recommended Becca Fitzpatrick's 'Hush Hush'. I knew it was a paranormal romance but I wasn't sure of what kind. I love the characters in this book. Lena and Ethan are such different people, yet together they make an awesome yet slightly unlikely couple. I adore Link, Ethan's best friend. He is your average jock, but he has a kind heart and he is very loyal to Ethan throughout the novel. Link's character is taken on an emotional rollercoaster that alters many of his beliefs in life. The other main character I cannot leave out is Ridley, Lena's cousin, who was a sister to her in her childhood days. Yet Ridley is bad news. She's a disaster area, always looking to create havoc in any way she can. Lena is a bit of an outcast at school, thanks to her uncle Macon, known to the town as 'Old Man Ravonwood'.Macon has been a recluse and because of that the people of the town have come to their own conclusions about him being somewhat mad and creepy. Ethan is also an outcast. Ever since losing his mum, he's kept himself to himself. The couple share a special bond where they can speak to each other's minds and they did so before they met.Throughout the novel, Lena is counting down to the doom that is her 16th birthday. When she has to choose whether she goes light (and protects the good) or dark (and succumbs to everything that is bad in the world). The novel is generally in Lena and Ethan's point of view, with historical flashbacks to gauge the story. I'm not usually into books that have a lot of flashbacks, but I can safely say that in this novel it aids the history of Lena and Ethan's families, giving you a much more informative and descriptive insight into their lives and what guides them. I was not disappointed. If anything, as soon as I'd finished this book I was eager for the second instalment, 'Beautiful Darkness'.This is a page turner that I would recommend to anyone that enjoys paranormal romances. If you have been hooked on Twilight or The Mortal Instruments then I can safely say you will not put this book down, and you will be desperate for more when you reach the very last page.